A question I keep hearing recently is ‘Does this add value to my life?' It’s a question The Minimalists ask themselves throughout their daily lives. I recently saw their wonderful film Minimalism about how having less is definitely more. What adds value to your life? It’s a useful question and one that I’m beginning to look into a little deeper. For a few years now I’ve been exploring a few different printing methods. From rubber stamp printing to linocutting, to letterpress and more recently woodblock printing. Through the process of exploration I’ve come to find that the process of woodblock printing resonates with me the most. 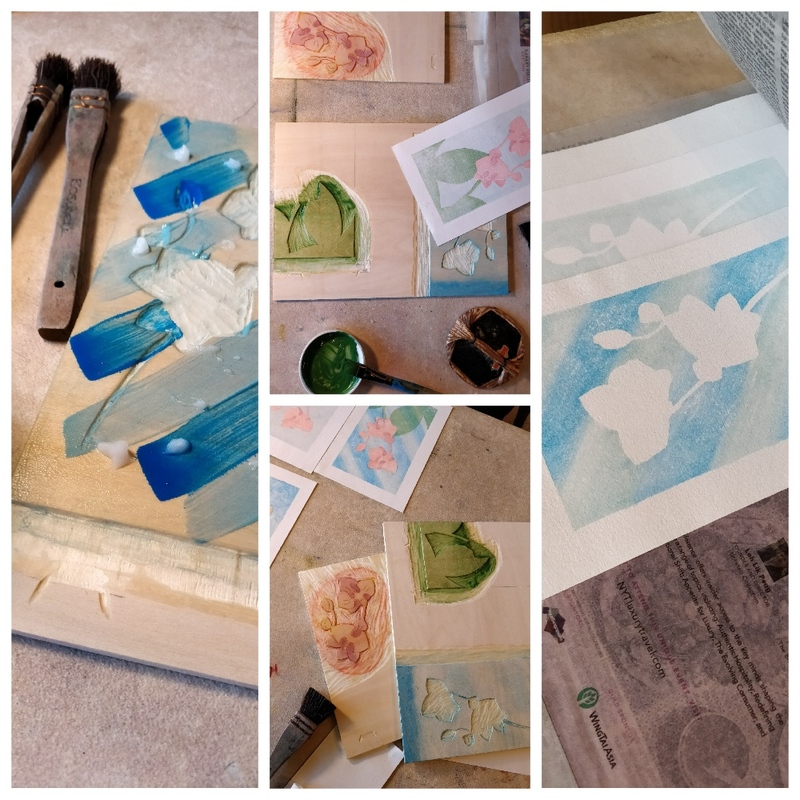 I am drawn to the process from beginning to end, from sketching an image, transferring the image onto the woodblock, then carving the image into the wood, dampening the paper and finally making a print with the baren. I love the materials used in the process and the way it helps me to slow down, focus and be more present. This process definitely adds value to my life. So I wonder why then I seem to be spending the least amount of time actually woodblock printing? One reason might be my slight phobia of multi-colour printing. I have continued to tell myself that I have woodblock BLOCK and a fear of creating a multi-colour print. It’s not as though I haven’t made a multi-colour print. I’ve been on a couple of group courses where I came away very happy with my colourful prints. But I also came away with that overwhelming feeling that the registration process was still somehow out of my reach. I had not asked enough questions. There was not always time or space in a group setting. When I had tried to make a multi-colour print back at my studio, each time the blocks wouldn’t line up but I couldn’t figure out what I was doing wrong. It was as if I had been transported back to the school maths class but this time the tutor had vanished. The 'how to' books and online videos were not helping. So it remained a complicated puzzle that I just could not unravel and so I put all the mistakes back in the drawer and froze. What I really needed was a one-to-one session with a printmaker with a hefty plunger who could help remove this gigantic blockage. Someone at my side to show me the process, who I could directly ask questions at any point in the day without interruption and be able to extinguish those burning questions in a moment. That someone was indeed the wonderful printmaker extraordinaire, Laura Boswell. Laura simplified the registration process for me, she made the whole woodblock printing process very accessible. She took measurements off the map, put my fears to rest and renewed my faith in my own ability to go forward with the process. Her down to earth approachable manner made the whole day a complete joy. So thank you Laura for helping to unblock the woodblock BLOCK and restoring my confidence. Your woodblock printing course has definitely added value to my life!